Finnish Lapland is the perfect destination in summer for trekkers, hikers, and even cyclists who want to get away from it all, to spend time alone exploring a landscape that is ever changing. All twelve of Finland’s Wilderness Areas are located here, which together cover an area of 15,000 sq. km. Lapland is also home to five of the nine National Hiking Areas, ranging in size from Inari, which covers 1,215 sq. km. to Iso-Syöte which is a mere 11.5 sq. km. You’ll also find seven of the country’s forty (yes, 40!!!) National Parks here, covering a total area of around 10,000 sq. km. Combined, these areas offer the adventurer over 22,000 square kilometres of natural beauty to explore and enjoy. Next to, and within, many of these parks, trails and wilderness areas are visitor centres where you can get advice from experienced local guides to help plan your trip, and within the areas are free open wilderness huts where you can stay overnight, day huts, and even Lapp pole tents, all provided free. It’s also worth remembering that the further north you go in Finnish Lapland, the more hours of sunlight you get in the summer; in fact at the most northern tip of the country the sun doesn’t set for 73 days. Finnish Lapland is also one of the most popular destinations in the world for sporting fishermen. This is not just due to the magical experience of being able to fish under the midnight sun, but to the great variety and abundance of game fish in the crystal clear, unpolluted waters of the Arctic. The pristine waters of Finnish Lapland offer the angler excellent opportunities to make a catch worthy of their innate storytelling skills, whether they’re in pursuit of salmon, grayling, trout, arctic char, or the elusive whitefish. The river Teno is deservedly known as the best salmon river in Europe, with the river Tornionjoki not far behind. Salmon weighing from 15 to 25 kilos are caught regularly every year, in the rivers named above as well as in the rivers Näätämöjoki and Simojoki. The speciality of Lapland is the beautiful red-bellied arctic char, which can be most easily found in the lakes of Inarijärvi and Kilpisjärvi, or in the rivers and small lakes of Lapland’s mountains. Lake Inarijärvi is also a fine spot to find trout that weigh several kilo, as are the rivers in the Kuusamo and Vätsäri areas, and indeed in many other areas of Lapland. Grayling are common here, growing to sizes that would be uncommon in most other waters. The river Tornionjoki, and its headwaters, provide some of the best chances for catching grayling, as does the river Teno, and the waters of Vätsäri, Kaldoivi and lake Inarijärvi. Whitefish can often be found in the same waters as grayling, especially in large river pools where the water is somewhat sluggish, and are a real challenge for the angler. It’s worth noting that there are some excellent pike and and perch waters in this region, with lakes in the wilderness often producing perch of almost a kilo in weight, and truly huge pike. As wonderful as the summer in Lapland is, the most important season here is the winter. Daylight hours diminish the further into the winter, and the further north you go, yet there is something quite alluring about a landscape that is lit only by moonlight and the stars, and of course the enchanting illumination provided by the mysterious beauty of the Aurora Borealis, or Northern Lights. Winter here is a time of sleigh rides, whether pulled by husky or reindeer, a time for skiing, skating, and snowball fights, for experiencing the thrills of a snowmobile safari, and a time for that most peaceful of pursuits, ice fishing. It also a time to reawaken the child in us all by experiencing the joy of Christmas, and the wonder of Santa Claus and his industrious elves. 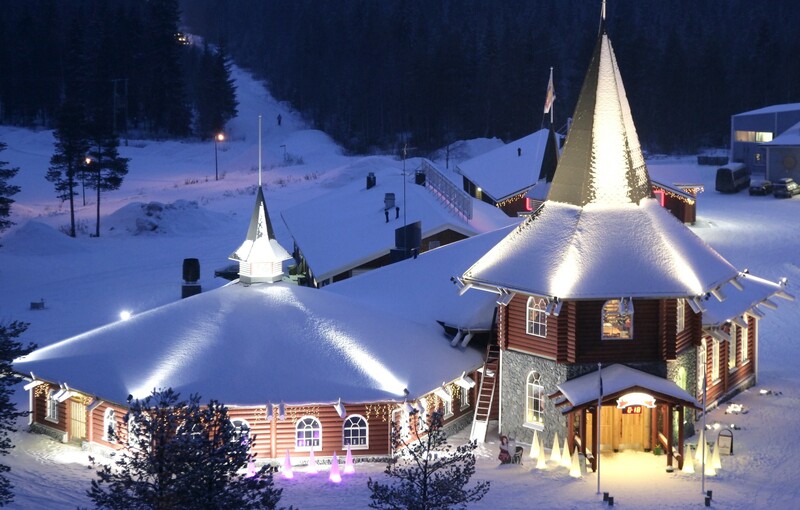 Tourists from all corners of the earth flock to the village of Napapiiri, just outside the Lapland capital of Rovaniemi, just to meet the great man, in the adorable Santa Claus Village. Santa Claus Village is a truly magical place for the young and old alike. Just 8km north of Rovaniemi, it can reached easily by the number 8 bus which runs frequently from the city centre. Santa Claus can be met in person at his office, and you can send mail to friends and relatives from the Santa Claus Main Post Office, where your letters and cards are stamped with the unique Arctic Circle postmark. There are plenty of souvenir and gift ware stores in the village where local handicrafts can be bought, as well as numerous workshops with different programmes. 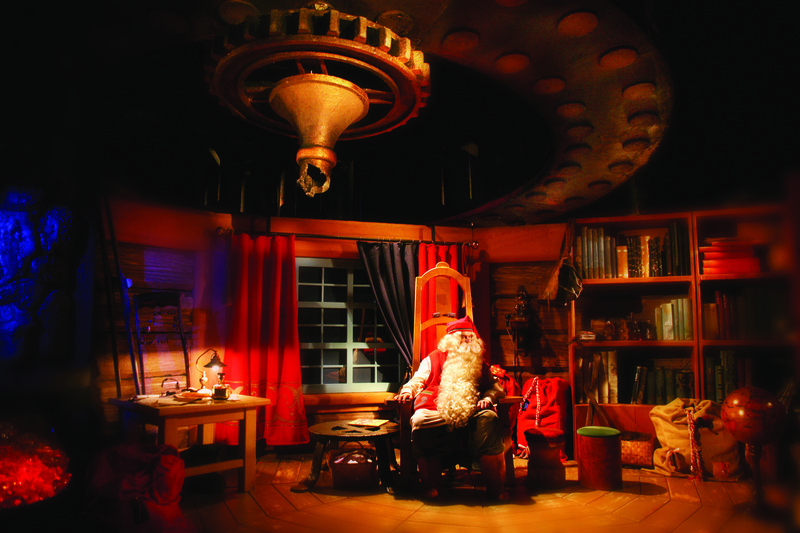 Santa Claus Village also has an ongoing exhibition in the Christmas House, where the traditions of this great holiday are explored, from Lapland and from other countries such as Japan, Russian, Germany, Iceland, the U.S., the U.K., France, Austria, Poland and more. Nearby is Santa Park, an underground adventure park, an Ice Park, the Arctice adventure site (featuring the longest slide in Rovaniemi, an ice bar where drinks are served in glasses made of ice, a carousel sled, and igloos), the Arctic Circle Husky Park where you can arrange to take a ride on a sleigh pulled by huskies, a Snowmobile Park, Eräsetti Wild North which arranges activities every day, Poroajelut Ari Körkkö with reindeer sleigh rides, and the Sirmakko Reindeer Family, where you can experience a real reindeer farm, Lappish ceremonies, and original Lappish meals.